If you missed our 20th anniversary, you missed a truly special event! At the last minute, several things which had been "tentative" all came together to make for an interesting and enjoyable meeting. 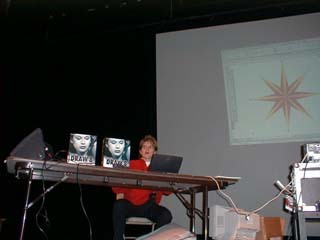 Two very good and interesting presentations, from Corel and MovieWorks, a special visit by Apple's User Group Liaison, Brighid Brady -deLambert, refreshments, anniversary cake, prizes and a MacOS8 photo booth shipped in for the event by Apple Computer. First, I'd like to thank all of the people who helped make this meeting happen. Special thanks to Beth Medlin, our office manager, who put in many hours of work and provided most of the refreshments. She is a priceless resource to the Pi and worth 100 times what we are able to pay her. Also, a thousand thanks to our President, Lorin Evans for his sage wisdom, strong back and support in making this all come together. Like many events of this kind, this one took on a life of its own along the way. I invited MovieWorks a few months ago and decided to reserve the second half of the program for some 20th anniversary "special events" to be determined later. Well, the "special events" were not happening, so I got Corel to fill in the blank space. As soon as the Corel appearance was confirmed, the ideas for "special events" began to arrive. First Brighid called from Apple to offer the MacOS 8.5 photo booth. 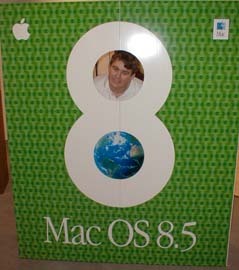 In case you missed the meeting, it is a 7-foot tall mock-up of a MacOS 8.5 product box with a hole in the top part of the "8". You stand in the box with your face in the hole and get your picture taken. Well, when we accepted the offer, we didn't know it came in a big, heavy, wooden crate that was over 7 feet long! I had to drive up to the Pi office on Friday afternoon and Loren and I wrestled the thing into my van. It just barely fit! Then my son David and I arrived about an hour early on Saturday morning to set it up. I also had in my van two cases of 20th Anniversary Journals, door prizes, 4 cakes, knives, napkins, forks, plates and a chocolate capitol building, which we gave to Brighid as a gift. David Essick as a cover celebrity for Mac OS 8.5. Like most meetings, this one began with the Question and Answer session, hosted by Pi Secretary, Lawrence Charters. Lawrence is another of those individuals who are incredibly giving of their talents to the Pi. In addition to being the Secretary, he is also the Webmaster who maintains our Web site. He is extremely knowledgeable about the Macintosh and I count on him and Tom Witte, another board member, to help with the Q&A as I get vendors set up and the meeting running. I'm sure the Q&A was excellent, as usual, but I heard little of it as I got Corel set up and tended to about a hundred other little details. Corel Draw 8, the latest incarnation of Corel's drawing and painting program contains lots of exciting and fun new features. Corel Draw 8 for Power Macintosh has finally shed most of its "ported from Windows" look and has a much cleaner interface with a huge number of customization features which let you create a work environment which allows the user to customize tool bars, keyboard shortcuts and menus to match the way they work. Nearly all of the new tools are "live" and "interactive" showing instantly the results of applying a tool to an image. In addition, there is a "property bar" which changes controls and settings which relate specifically to the selected object or tool. This helps to eliminate the all too frequent dialog boxes of other programs. The demo started with a brief overview of the product and a tour of the screen features. It then launched directly into the design of a logo and brochure for an imaginary tour company. The demo was well planned and certainly featured many of the strong new features of Corel Draw 8. "Cool tools" included the Image Sprayer, Image Stitch, Interactive Drop Shadow and many others. There are also lots of fun things to do with distortion and fill tools which were used to design the logo. As usual, it is almost impossible to describe the results of a visual demo. The Corel rep did a great job of showcasing her product to its full advantage. To make a great deal even better, there was a special price offered to meeting attendees. Corel demonstrates their hot new CorelDraw 8 with a suite of tools that competes with Adobe's Illustrator and Photoshop but at a fraction of the price. Corel Draw 8 for Power Macintosh is AppleScript aware and supports both QuickTime and QuickTime VR. It is cross-platform compatible with the Windows 95/NT/Alpha versions of the same product. It can also read Photoshop, Illustrator, Painter and PDF files as well as most other "standards" such as EPS, TIFF, JPEG, etc. For the professionals in our midst, it supports most popular color management tools and color models. It can output to all levels of PostScript and most service bureau standards. The package comes with Corel Draw 8 for Power Macintosh for illustration and page layout, Corel Photo-Paint 8 for photo editing and bitmap creation, CorelTrace 8 for bitmap to vector conversion, Font Reserve 1.02 for font management and Canto Cumulus Desktop 4.0, a media management utility. It also contains samples of third-party plug-ins such as Digimark digital watermarking, Auto F/X Photo/Graphic Edges, Xaos Paint Alchemy and Cytopia PhotoLab. In addition the package includes 1,200 clipart images, 100 digital photos, and GIFs, themes, objects and more for Web publishing and 1600 TrueType and Type 1 fonts. Corel Draw 8 requires MacOS 7.6.1 or greater on a Power Macintosh with at least 32 MB of RAM with virtual memory enabled and a CD-ROM drive. During the break between vendors, we took some time to recognize some of the special people who have made the Pi what it is today. A really special treat was the appearance of Brighid Brady-deLambert, Apple's User Group Liaison, to present a special poster created for Washington Apple Pi to commemorate its 20th Anniversary. The poster features pictures of Apples products over the years, from the Apple I thru the G3 Powerbook and states "1978 - 1998 , Twenty Years That Changed Computing." Brighid presented this poster to Pi President Lorin Evans. We were also extremely pleased to have founding member Dana Schwartz in the audience. Dana, who is "officially" member 002, was instrumental in getting the Pi rolling in those early days of 1998. We were extremely happy to have him there. We also introduced and presented our thanks to our Office Manager (and cookie baker and surrogate mom) Beth Medlin. I honestly don't know how we could thank her enough for the tireless work she does for us. Hopefully the roses and certificate were able to convey some of our thanks. Certificates were also presented to Jon Thomason, our resident Guru and software wizard who keeps our TCS and Web site operating and growing, Lawrence Charters, Q&A host, Webmaster extraordinaire and Pi Secretary, Board Members Dave Ottalini, Pat Fauquet, Tom Witte, Dave Weikert and yours truly. There are many others who deserved just as much recognition, but there was only a limited amount of time. My personal thanks to all of you who assist in making this meeting happen 10 times a year. 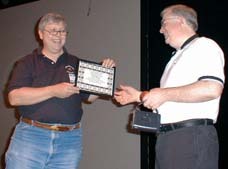 Veteran Pi Director Tom Witte presents Lawrence Charters with a "free Macintosh" and certificate for service to Washington Apple Pi. Other honorees were Beth Medlin, Jon Thomason, Dave Ottalini, Pat Fauquet, Tom Witte, Dave Weikert and Don Essick. Next up, direct from Pleasanton, California, Bill LaCommare and MovieWorks. I first saw MovieWorks at MacWorld in New York this summer. I was talking to Jack Quattlebaum of Apple Computer in the Apple booth. He was demonstrating QuickTime and told me about this great product he had seen over in the other room. He took me over and arranged a demo of MovieWorks. I was very impressed by the demo and immediately invited them to come to a general meeting and demo the product. Well, it took a while, but it was worth the wait. MovieWorks is a QuickTime authoring package. True enough, but it is much more than that. It is really a suite of applications for QuickTime movie or slide show productions seamlessly integrated using AppleScript. MovieWorks allows you to put together pictures, video, titles, narration, music, animation and effects into a professional looking production quickly, easily and also inexpensively. We were, by the way, the first public showing of the newest release of the product. Bill first gave us a tour of some example movies and slide shows created with MovieWorks. The examples ranged from a "Travel Brochure" presentation to a wedding video to an elementary school video yearbook. He then demonstrated just how easy it is to assemble your own pictures and sounds into your own slide show or movie. The best part is that once the movie is rendered into QuickTime format, it usually takes up much less space than the original. There were several examples in the demo, which were many minutes of pictures and sound that still fit on a floppy disk! As you can see from the above, there are tools for Video Editing, Animation, Paint, Sound and a MovieWorks Player. At each step of your creation, you can immediately play what you have created and see if you like what you did. If you don't like it, undo it and try again. Hopefully, we will get a slide show of many of the photographs taken at the celebration uploaded to the Web Site for you to see in a MovieWorks slide show by the time you read this. There are tutorials and sample artwork, sounds, backgrounds and lots of other goodies on the CD. I found this to be an easy package to learn and use. Hopefully you'll get to see the results in the not too distant future. This is a great product for anyone with a digital camera or video camera. Bill gave the meeting attendees a very nice anniversary present -- 50% off the retail price for sales at the meeting. I keep telling you that it is very worth your while to attend the meetings. Vendor discounts, door prizes, we even had anniversary cake, cookies, bagels, soft drinks, and Corel brought mouse pads, pens and other goodies. Apple T-Shirts - Michael Skinner, Anson Gieger, N.L. Kaufman, Mark Zolenas, Susasn Ware, Arthur Brocof, Fred Mineito III, Ken Lutterman, Douglas McNeill Thomas Berens, Jim Diamond, David M. Wilson and Susan Schwqartzman. Corel Posters - Charlie Stancil, R. Mereness, Don Fortnum, Bill Jensen, David Nicolson, Henry Ware, Dana Schwartz and Don Reilly. Claris Works for Kids - Dave Myslinski and Tom Witte. AppleWorks 5.0 - Jon Pects and James Dennis. Think Different Watch - Eric L. Mackenzie. Corel Draw 8 - Gary Mannering and Vernice Christian. MacOS 8.5 - Bob O'Brien, Ken Clare, Len Ailler, Maria Guanio and Frank Pappajohn. Mary Keene and Carmen Ciemny also won prizes, but somehow in the confusion I forgot to write down what they were. Congratulations to all of our prizewinners. Next month, December 12 is the "Garage Sale" across the lobby in the Gymnasium. On January 23, J.D. Mankovsky of Apple Computer will return to give us an Apple update and complete report on announcements made at MacWorld San Francisco. Please send suggestions as to vendors you would like to see at future meetings to me at don.essick@tcs.wap.org. I have Adobe, Quark and Aladdin in the queue, but none have confirmed dates as yet. I'll update the schedule as soon as I know more. See you at the Garage Sale!